At Greengo Landscaping, we are proud of our environmental management. This is a good time to tune-up your irrigation system and consider upgrades to improve efficiency. Maintenance performed now can reduce your water bill and help keep your landscape healthy. 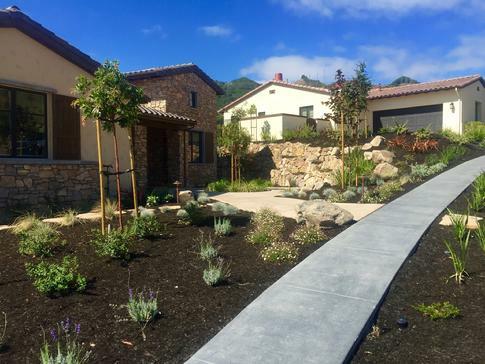 Some water agencies are offering rebates to customers who replace their lawns with native, drought tolerant landscaping. The Contra Costa Water District is requesting its customers to voluntarily reduce water use by 15%. Because much of the savings will need to come from landscape water use, the District estimates that up to 25% of landscape water use may need to be reduced to meet the overall 15% goal. Drip irrigation is the most efficient method of irrigation. While sprinkler systems are around 75-85% efficient, drip systems typically are 90% or higher. For this reason drip is the preferred method of irrigation in the desert regions of the United States. But drip irrigation has other benefits which make it useful almost anywhere. The high efficiency of drip irrigation results from two primary factors. The first is that the water soaks into the soil before it can evaporate or run off. The second is that the water is only applied where it is needed, rather than sprayed everywhere. New blends of turf grasses are 50% to 70% more water efficient than traditional varieties. Netafim's drip irrigation systems maximize the grasses water efficiency while maintaining their beautiful aesthetics despite California's scorching summers. Multiple rotating stream use less water and provide heathier growth. Rotating nozzles deliver multiple streams of water at a steady rate. This slower application rate allows water to gently soak into the soil and achieves an even distribution throughout the area being irrigated. This increased efficiency results in 30% less water use when compared to traditional sprays and significantly reduces wasteful runoff. These nozzles can be installed onto any conventional spray head body or shrub adapter, transforming them into high uniformity, low precipitation rate sprinklers. Smart controllers save time, money, and water with self adjusting weather sensing technology, the controller automatically adjusts the watering schedule to take into account both the seasons and current weather conditions. This allows the controller to optimally water plants and lawn all year round without the need to constantly reprogram the controller throughout the year. Tests have shown smart irrigation controllers to save up to 25% more water than traditional irrigation controllers. LEDs offer substantial opportunities to reduce energy consumption and maintenance. The advantage to LED technology is long lasting bulbs. LEDs use a tiny amount of electricity compared to traditional bulbs thus offering low cost of ownership.